TORONTO (AP) After a huge first half, Stephen Curry and the Golden State Warriors had to hold on late to wrap up their eighth straight win over Toronto. 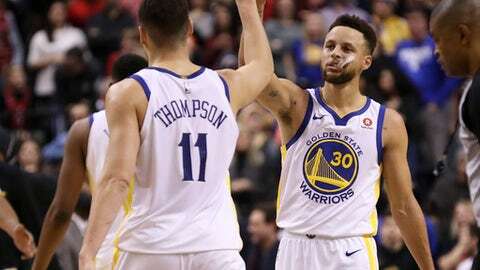 Curry returned from a two-game absence to score 24 points, Klay Thompson had 26 and the Warriors blew nearly all of a 27-point lead before beating the Raptors 127-125 on Saturday night. DeMar DeRozan scored 42 points for the Raptors, who made it a tight game after the Warriors rang up 81 points on 71.1 percent shooting in the first half. The Warriors won at Milwaukee on Friday. Durant scored 25 points and Draymond Green had 14 for the Warriors, who have won 12 straight on the road. Golden State’s 19 road wins are the most in the NBA. OG Anunoby had 17 points and Serge Ibaka 14 for the Raptors, who rallied from a 19-point deficit through three quarters to make it a one-point game in the fourth. Fred VanVleet scored 13 points and Jonas Valanciunas had 12 as Toronto lost for the third time in 18 home games. ”We’re not really into moral victories around here so you’ve got to look and see what you could have done better,” VanVleet said. Curry sat out Wednesday’s home loss to the Clippers and Friday’s win at Milwaukee because of a sore right ankle, the same injury that kept him out of 11 games in December. Curry finished with a team-high nine assists. His six rebounds tied Durant for the team lead. Raptors guard Kyle Lowry missed his third straight game because of a bruised tailbone. VanVleet’s 3-pointer with 3:52 left cut it to 116-115, but Curry answered with a 3 for the Warriors. DeRozan’s basket with just over a minute to go made it a one-point game again, and Curry missed a pair of free throws with 45 seconds remaining. After a missed shot by DeRozan, Durant’s jumper with 21 seconds left gave Golden State a 125-122 lead. A missed 3 by CJ Miles led to a jump ball, then a scramble for a loose ball that went out of bounds next to the Warriors bench. After a video review, Golden State was awarded possession with three seconds left. Curry was fouled and sealed it with a pair of free throws before VanVleet hit a buzzer-beating 3. The out of bounds call was one of several decisions that had DeRozan fuming about the officiating. Green and Thompson each scored 10 points in the first and Golden State led 43-35 after one, its highest-scoring opening quarter of the season. Golden State seized control with a 16-2 run to begin the second quarter and led 81-54 at halftime. It was the Warriors’ biggest half of the season and their first 80-point half away from home since Nov. 2, 1990, at Denver (87 points). ”You knew we weren’t going to do that the whole game,” Kerr said. Warriors: Golden State made eight of its first nine shots. … The Warriors had one turnover in the first half. They finished with a season-low seven. … F Andre Igoudala played eight minutes in the first half but did not return in the second after a recurrence of the hip injury he suffered in Friday’s win at Milwaukee. … F Omri Casspi missed his second straight game because of a sore lower back. Raptors: DeRozan scored 19 points on 14 shots in the first quarter. … Ibaka returned from a one-game suspension for throwing a punch at Miami’s James Johnson in Tuesday loss to the Heat. A sheepish Durant grinned and slapped palms with Curry and Green after his one-handed dunk attempt in the second bounced off the rim and landed in the front row. Durant threw down a two-handed slam on Golden State’s next possession. Warriors: Visit Cleveland on Monday in a rematch of the past three NBA Finals. Raptors: Visit Philadelphia on Monday afternoon.